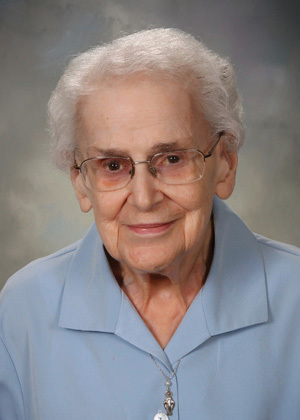 Sister Philomena Rosselli, BVM (St. Philomena), 97, of Marian Hall, 1050 Carmel Drive, Dubuque, died Friday, June 15, 2018, at Marian Hall. Visitation was held 9:00-10:15 a.m. on Thursday, June 21, 2018, at the Marian Hall Chapel, followed immediately by the Sharing of Memories and the Mass of Christian Burial. Burial was in the Mt. Carmel Cemetery. Sister Philomena was an elementary teacher at St. Anthony ES and Montessori School and tutor at St. Raphael Learning Center, all in Dubuque, and an elementary teacher at Sacred Heart ES in Maquoketa, Iowa. She also taught in elementary schools in Chicago; Butte and Missoula, Mont. ; and San Francisco. She was born in Petaluma, Calif., on Sept. 13, 1920, to Genesio and Philomena Zanini Rosselli. She entered the BVM congregation on Sept. 8, 1938, from St. Vincent Parish, Petaluma. She professed first vows on March 19, 1941, and final vows on Aug. 15, 1946. She was preceded in death by her parents; a sister Agnes Rosselli, BVM (Genesio); half-sisters Regina Rosselli and Candida Rosselli; and half-brothers Elvis and John. She is survived by cousins and the Sisters of Charity, BVM, with whom she shared life for 79 years.